The PneumaticBox is a control system developed to enable fast, realtime control of pneumatic systems. Most commercially available solutions are developed for relatively slow process control scenarios, where being a few milliseconds off isn't a problem. Additionally, pneumatics control traditionally is done open-loop and available solutions do not provide for incorporating rich, real-time sensor feedback. The latter especially is a requirement specific to robotics. 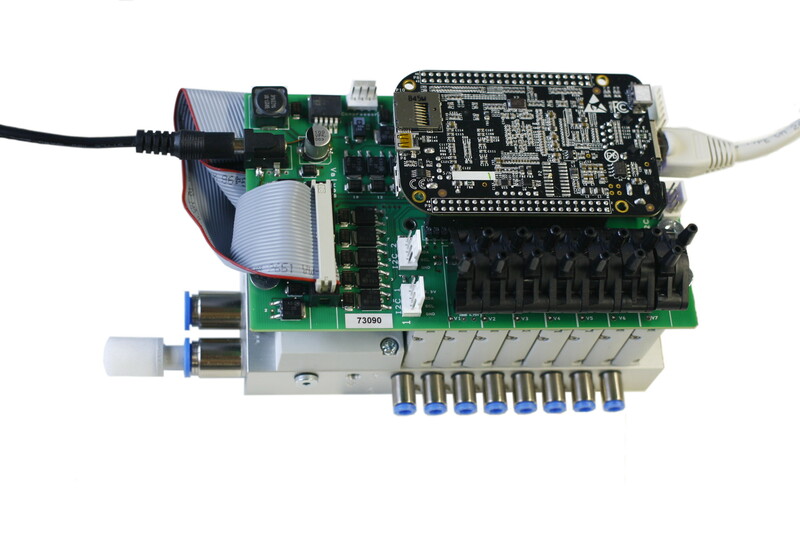 Provide easy integration paths for hardware sensors via I2C, SPI busses. The Software stack is based on a Ubuntu distribution customized for the Beaglebone Black board and provides a complete Linux with the ability to run ROS nodes and time synchronization for timely event execution. A firm Real-Time control process airserver which handles sensor input, valve output, the execution of low-level controllers and timely execution of scheduled signal events. Runs at 500Hz. Clients issue asynchronous messages to configure controllers, schedule changes in client signals and monitor any signals generated within the airserver. A reference client library in Python for configuring and asynchronoulsy controlling the airserver via a TCP/IP socket. If you are interested in our PneumaticBox CAPE or are looking for a do-it-yourself solution for controlling a number of electromechanically actuated valves, you are welcome to reproduce our PneumaticBox CAPE! We are publishing the production data (Gerber Files, Drill Files, Bill of Materials as well as Schematics and PCB as PDF-Files) for easy reproduction of our system. The data is provided as-is and we do not offer any support.